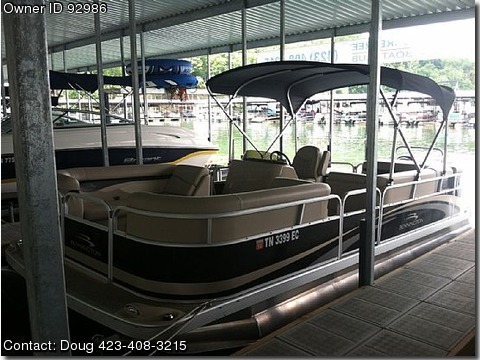 Contact Doug @ (423) 408-3215 to schedule viewing of this boat located in Johnson City, TN at www.RockinghamMarina.com. There's nothing entry level about the new Bennington 24 SL with the optional Express Third Tube Package besides the price! If you're looking for speed and quality in a pontoon boat but not the hefty price tag, this is the boat for you! Powered by a Yamaha 150 HP Four Stroke outboard with at 5 year warranty, this boat will move! Includes tow bar and all the extras you need! This boat has very low hours and is located at Rockingham Marina on Boone Lake in Johnson City, TN. If you prefer "Boating without Owning", this model is also available as part of the Carefree Boat Club on Boone Lake, South Holston Lake, and Watauga Lake.